Healthy Choice Launched New Vegan + Vegetarian Power Bowls! With the holidays ending almost a month ago, it means people are back to the day-to-day hustle and work is in full swing! I know once I’m back to work and catching up post-holidays I get very busy in January! I love eating and cooking at home, but my busy schedule can make it hard to always make a meal from scratch. To eat healthy, yet save time I have been loving the new Healthy Choice vegan and vegetarian bowls, as well as their morning Power Bowls. As a vegetarian, and someone with a lot of vegetarian or vegan friends, I love seeing that Healthy Choice has taken the initiative to create numerous new meals that are vegetarian and vegan, and of course meats their goal for providing people with a quick-and-easy well-balanced meal. First I want to talk a bit about their morning Power Bowls that Healthy Choice sent me to try. Unwrapped Burrito Scramble: This bowl has turkey sausage with egg whites, black beans, and veggies on top of protein-filled grains with spicy tomatillo sauce. My husband tried this one and really enjoyed it. He said that he felt quite energized throughout his morning having had this quick protein breakfast. He also enjoyed the spicy kick to it! Turkey Sausage & Egg White Scramble: Turkey sausage, egg whites, veggies on top of protein-filled grains and creamy avocado sauce. Roasted Red Pepper & Egg White Shakshuka (Vegetarian): Egg whites with red bell peppers, onion, chard, kale & spinach on top of protein-packed grains topped with feta cheese. Pesto & Egg White Scramble (Vegetarian): Egg whites with kidney beans and veggies on top of protein-packed grains, topped with basil pesto and parmesan cheese. This was a nice, light tasting breakfast. I really liked the combination of kidney beans with egg whites. It gave you that protein fuel without feeling too filling or weighed down. Overall, I was very impressed with the two flavors of Healthy Choice morning Power Bowls my husband and I tried. Often for breakfast my husband and I get in a rut, making the same things over and over again for breakfast since we are normally tired and/or in a hurry. It was nice to have a breakfast packed with flavors, as well as one filled with protein to make us feel energized while we are off to work. 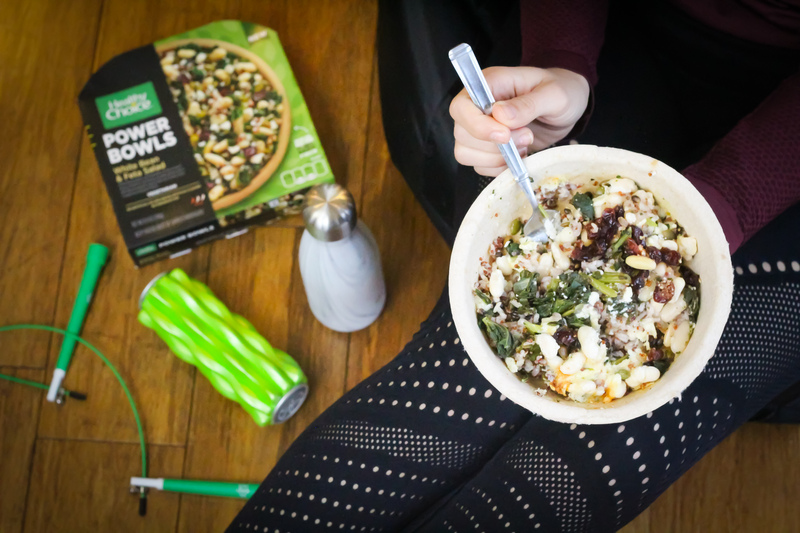 White Bean & Feta Salad (Vegetarian): White kidney beans with kale, chard, & spinach on top of brown & red rice, quinoa, and barley, topped with feta cheese, dried cranberries, and roasted pepitas. I loved the textures of this bowl. The combo of the beans with the various protein-packed grains and crunchy greens, rich with feta flavor on top was perfection! This was great if you’re in the mood for a warm salad at lunchtime where you want to get a lot of veggies in! It’s also a great protein refuel after a workout. Mango Edamame (Vegetarian): Edamame, mango, and veggies on top of brown & red rice, quinoa and barley. Topped with red wine vinaigrette, dried cherries, and sunflower seeds. Falafel & Tahini (Vegan): Falafel with red onions, tomatoes, chard, kale, and spinach on top of brown & red rice, quinoa and barley. Served with sesame tahini sauce. This bowl was my personal favorite of all the Healthy Choice Power Bowls. I absolutely love falafel, so really enjoyed the Greek flare to this bowl. This will probably be the one that I purchase again and again! Cauliflower Curry (Vegan): Lentils & cauliflower with chard, kale, & spinach served on top of brown & red rice, quinoa, barley and served with a spicy curry sauce. I can’t wait to try the other vegetarian and vegan buddha bowls Healthy Choice has created! They’ve been perfect for quick, protein-packed, well-balanced meals for lunch or dinner! To purchase the new Healthy Choice morning Power Bowls and Healthy Choice vegan or vegetarian Power Bowls, click here.